www.style.pk is first one to announce the new collection by Libas. Read to know. Shariq Textiles is an established and very successful name in Pakistani fashion market. Shariq Textiles are operating in Pakistan for a long time. This textile specializes in launching different lawn collection every season and every occasion. 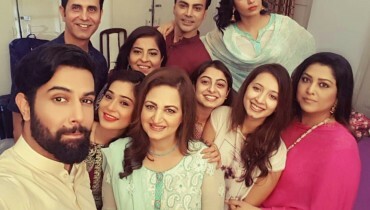 Their famous collections include Subhata Lawn Collection 2012, Subhata Embroidered Collection, latest Reeva Designer Lawn Collection, Libas Collection, Rivaj Collection, and Deeba Designer Lawn. All the Shariq Textiles Collection has one thing common i.e. superior quality. But the designing of every suit in every collection differs a lot from each other. Shariq Textiles manufactures casual and even formal wear for women. These clothes in every collection are just perfect to be worn casually as well as formally. What one needs to do it is carry that dress with style and confident. Shariq Textiles dresses are especially perfect for summer season as Lawn is the kind of cloth to be worn in hot season. Designs are extremely fresh and gets better in every collection. Shariq Textiles offers these dresses to women and girls at very reasonable and market competitive prices. Shariq Textile’s brand Libas has just launched its new collection Libas Exclusive Embroidery Collection. 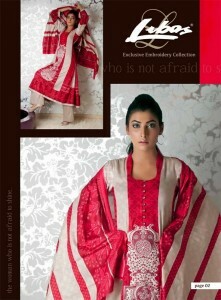 Libas Exclusive Embroidery Collection 2012 does not need any reasons to prove its quality. The name Libas Exclusive Embroidery Collection 2012 itself says everything. Exclusive is the word to focus on. The new Libas Exclusive Embroidery Collection 2012 is launched just few minutes back and www.style.pk is here with all the pictures of this collection along with its details. The catalogue of Libas Exclusive Embroidery Collection 2012 empowers women and which is obvious as the collection is targeting women. The lines Libas has used are Embrace the Diva Within! And the woman who is not afraid to shine, e.t.c. The Libas Exclusive Embroidery Collection 2012 has very unique designs and perfect blend of colors and combinations. The Libas Exclusive Embroidery Collection 2012 is perfect to wear in this monsoon season which is just around the corner. Take a view of Libas Exclusive Embroidery Collection 2012.